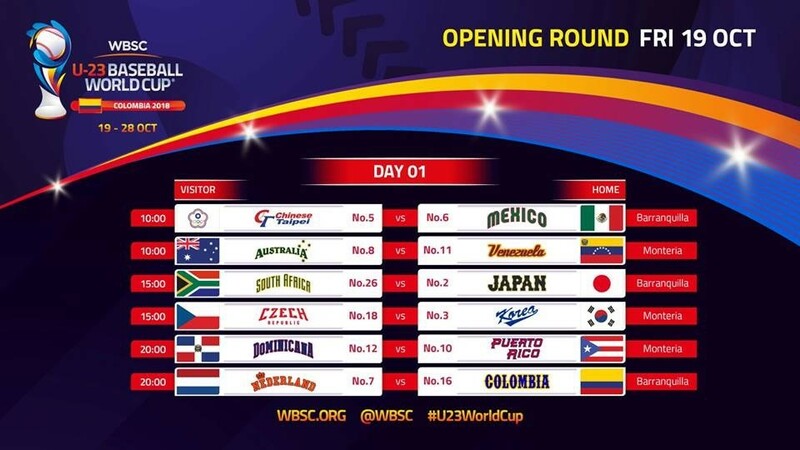 LAUSANNE, Switzerland -- The World Baseball Softball Confederation today revealed the Official Game Schedule for the U-23 Baseball World Cup® 2018 -- the biggest international baseball event of the year and biggest ever in Colombia. National Team rosters are expected to feature players within the organisations of the Australian Baseball League (ABL), Chinese Professional Baseball League (CPBL), Dominican Professional Baseball League (LIDOM), Korean Baseball Organization (KBO), Major League Baseball (MLB), Mexican Baseball League (LMB), Nippon Professional Baseball (NPB), Puerto Rico's Roberto Clemente Professional Baseball League (LBPRC) and the Venezuelan Professional Baseball League (LVBP), in addition to other leagues from around the world. WBSC President Riccardo Fraccari said: "The U-23 Baseball World Cup will be the last major opportunity to earn world rankings points and be among baseball's 12 best nations, which earns you qualification into next year's Premier12, which is baseball's first Tokyo 2020 Olympic Games Qualifier." •	Game 1: Superpowers from the Americas and Asia will collide when world No. 5 Chinese Taipei and No. 6 Mexico meet. •	Game 2: The 2016 U-23 silver medallists, No. 8 Australia, will open against No. 11 Venezuela, the current U-23 Pan Am champions. •	Game 3: No. 2 Japan, the defending U-23 World Champions, will face Africa's top-ranked team, No. 26 South Africa. •	Game 4: One of Europe's top squads, No. 18 Czech Republic, will battle one of the top-ranked teams in Asia and the world, No. 3 Korea. •	Game 5: Caribbean rivals and baseball powerhouses -- No. 12 Dominican Republic and No. 10 Puerto Rico -- will open their world cup tournament together. •	Game 6: South American host No. 16 Colombia will entertain Europe's top baseball nation, No. 7 Netherlands. The winner of the U-23 Baseball World Cup will be awarded 690 world ranking points -- the largest award of any international baseball event this year and third-largest overall, following the major international competitions, Premier12® and the World Baseball Classic.